Soak both rice and udad dal for 6-7 hours. Grind it into the smooth paste. Again leave it for 5-6 hours for fermentation. Take a bowl, add carrots, peas, French beans, capsicum, add salt, chaat masala and keep it for 10 minutes. Put water into the vessel-idli cooker. Let the water get boiled. Now take half khiru /batter into a small vessel. Add salt, ½ tsp cooking soda and 3-4 spoon boiling water. Mix it well. Grease oil in the bowls or idle stand. Put vegetables in the stand and pour the batter into it. Put it in the idli cooker and steam it for 15 minutes. Take it out after 15 minutes and put the other set of idlis. 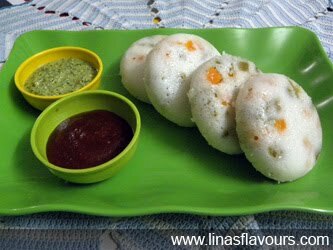 Adding cooking soda to every portion of batter to be steamed helps the idlis to raise it properly and make it soft. This is the other way to eat vegetables in a different way without using oil. Chaat masala gives a tangy taste and makes it tempting to eat. Other option is using the ready-made khiru. The procedure will remain same. You can save your time in making the mixture. Be sure you take out the mixture out from the refrigerator before 30 minutes so that it comes to the room temperature.